Our Tropical Retreat is a private 1 bedroom, 1full bath home with a full size shower-tub. The guest house is a resort-style guest home with a very spacious living area. It's also is air-conditioned, uncommon for vacation rentals in the area. The property features a full kitchen, a 50-inch LCD High Definition TV. The home is situated on over an acre of lush tropical gardens with numerous fruit trees and indigenous plants found only in Hawaii. It’s located approximately three miles from downtown Hilo. It's more than a beautiful place to stay, it’s a lifestyle. You'll experience charming “Old Hawaii” where life is slow and easy. Our property allow you to relax in style or pursue a variety of adventures right outside. Amenities include a secluded beautiful outdoor garden. The landscaped grounds and naturalistic setting capture the tranquility and beauty of the islands where travelers can relax and experience the true Hawaii where the locals live. We look forward to welcoming you to the Big Island of Hawaii. 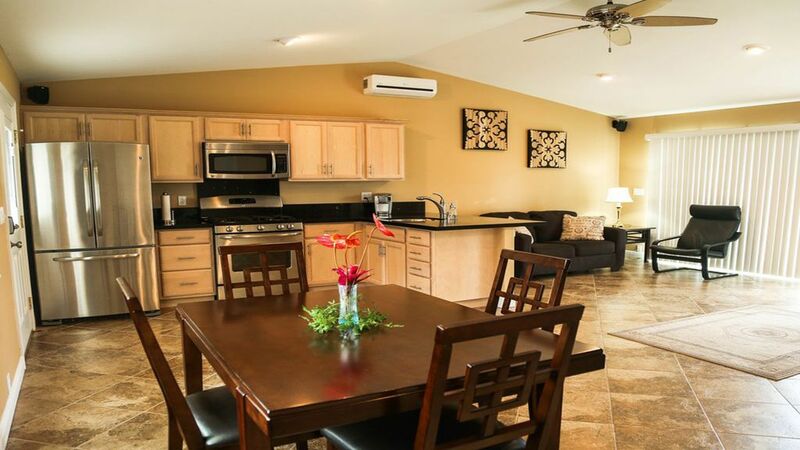 The Tropical Retreat Guest House provides a private vacation retreat with all the comforts of home for visitors and travelers to the Big Island of Hawaii seeking an alternative to the 'resort' atmosphere, where you won’t feel like a tourist. The kitchen is fully-equipped. Your hosts reside in a property nearby and will personally greet you and handle your personalized access when you arrive. Your host will answer questions you may have, assist you with any special needs and help you plan your stay... sharing tips on where to visit, how to get there, where to lunch and favorite local dining spots. The property is within walking distance to a very picturesque area of East Hawaii surrounded by streams, waterfalls and off a quiet street perfect for walking or jogging. A private serene opens up to views of the garden below for ultimate relaxation. Our Retreat is a perfect Hawaiian getaway for couples celebrating their special occasion, and is centrally located making it an ideal home base while exploring exotic points of interest on the island. Hilo is famous for its warm aloha spirit, relaxed lifestyle, unique shops, art galleries and restaurants with local regional cuisine. Local attractions include Lyman Museum, East Hawaii Cultural Center, historic Palace Theatre, Pacific Tsunami Museum, Imiloa Astronomy Center, UH Hilo Performing Arts Center and Hawaii Tropical Botanical Gardens. Hilo Farmer's Market is a favorite for fresh, local produce. The Merrie Monarch Festival, Hilo's premier hula competition and cultural event, is held annually in April. East Hawaii's black sand beaches and freshwater pools are some of the best for snorkeling, diving, surfing, paddle boarding, kayaking, swimming with turtles and tropical fish, or watching the whales off shore. Take a helicopter volcano tour or short scenic drive to active Kilauea volcano to view a lava flow, ride horses in Waipio Valley or tour the summit and view the night skies of Mauna Kea. Weddings, graduations, receptions or large gatherings may be allowed with owner's prior consent and only by arrangement with our event planning and management services. Professional photography services are readily available at reasonable rates. Contact us in advance to facilitate your special occasion set in the privacy of the grounds and lovely gardens. A personal private tour of can also be arranged to points of interest in East Hawaii previously mentioned such as a volcano tour at Kilauea, star gazing at the top of Mauna Kea or even a hike through Waipo Valley. Our retreat is a Non-Smoking property: Hawaii State Law dictates that all public areas are designated as smoke free. The safety and comfort of all our guests is of utmost importance to us. As such we have a non smoking policy. Smoking is not allowed in any of our buildings or on the property grounds. Please inform your visitors of our non smoking policy. Your support and cooperation to maintain a smoke free environment. Free Nationwide long distance calls. Function such as emergency contact speed dealing, do not disturb, Three way calling, and many others. Free parking right by the entrance of the guest house with its own private driveway.